…You want to learn video and TV marketing from arguably the most successful practitioner of all time? Throw in a stable of the top thoroughbred copywriters practicing today and some of the world’s top authentic Internet marketing advisors. P.S. Who among the thousands of people who’ve declared themselves “experts” over the years was chosen to represent the Internet at this one-of-a-kind event? 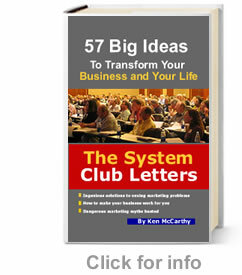 The founder of the System Club: a group you should seriously look into joining.